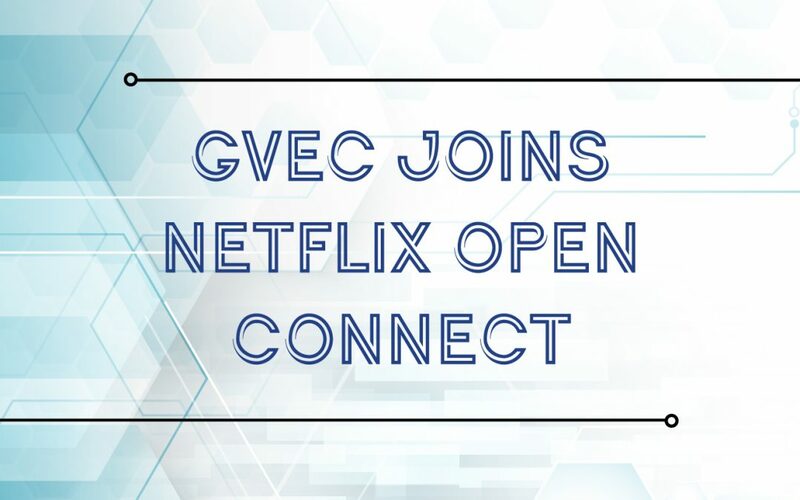 We’ve got some good news for all GVEC Internet customers: GVEC has joined the Netflix Open Connect program. This program allows GVEC to host and serve Netflix’s content library locally, from our own data centers. With Netflix Open Connect, GVEC doesn’t need to buy any hardware to handle all the data and content associated with the program. Instead, Netflix supplies all the necessary servers (servers are specialized, “industrial strength” computers that transmit and direct data back and forth across the internet). Once installed, those Netflix servers—or “Open Connect Appliances” (OCA)—retrieve and store fresh Netflix content every day. As a result, GVEC Internet customers stream videos from within GVEC’s service territory, greatly reducing the physical distance Netflix data travels. Why is that a big deal? With Netflix Open Connect, we eliminate almost 1,800 miles of data nodes, junctures, conduits and choke points. This makes the Netflix streaming experience smoother, faster and more dependable. GVEC Internet customers who don’t subscribe to Netflix might be wondering, “Why should I care?” Well, avoiding all those virtual obstacles frees up vast amounts of bandwidth on GVEC’s network. Doing so creates an enhanced online experience for all GVEC Internet customers, including Netflix subscribers and nonsubscribers alike. Want to learn more about GVEC’s partnership with Netflix Open Connect or find out more about our GVEC Internet service options? Call us at 800.699.4832. We’re in the process of expanding our Fiber Internet service; our wireless internet options are faster and more dependable than ever, too. Call or visit gvec.net for more information.